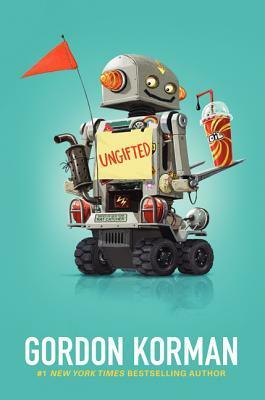 Description: The word "gifted" has never been applied to a kid like Donovan Curtis. It's usually more like "Don't try this at home." So when the troublemaker pulls a major prank at his middle school, he thinks he's finally gone too far. But thanks to a mix-up by one of the administrators, instead of getting in trouble, Donovan is sent to the Academy of Scholastic Distinction (ASD), a special program for gifted and talented students. It wasn't exactly what Donovan had intended, but there couldn't be a more perfect hideout for someone like him. That is, if he can manage to fool people whose IQs are above genius level. And that becomes harder and harder as the students and teachers of ASD grow to realize that Donovan may not be good at math or science (or just about anything). But after an ongoing experiment with a live human (sister), an unforgettably dramatic middle-school dance, and the most astonishing come-from-behind robot victory ever, Donovan shows that his "gifts" might be exactly what the ASD students never knew they needed. Jake's Review: It's a bit boring and there are lots of run on sentences. The kid kinda reminds of me and I wanna do the same sorts of things he does. But my mom and teachers will kill me if I did, but I understand his feelings. Its funny the situation he gets himself into. I think kids my age will like it. The geek kids are really smart but they are actually funny and cool and way smarter than me. The storyline isn't realistic, there is no way something like this would ever happen. Like the idea that sometimes teachers are just plain dumb, sort of like my teachers. I like that the geeks and the real kids got along with each other. Mom's Review: Love Korman books, he really knows how to write books that kids will enjoy (Not to mention - adults) This one is definitely more for kids but I still highly recommend it. Donovan is your typical middle grade boy. Nothing really special, goofs up all the time, but oh so very human. He isn't a mean spirited kid at all, just a kid who doesn't think about the consequences of his actions. Reminds me a wee bit of a certain someone. He is a kid the intended reader will relate to and have some fun with. Korman also tries to get across to kids (and to adults) the huge problems with labeling and separating kids based on educational level. I did find this one uneven at times and some of the thought processes seem to be a little to adult for a middle grader. Also way too many points of view. but still a fun read.